I just started to make a blog on freeware Human Resources software in order to help new employers, starting businesses, small companies, ... to streamline their Human Resources Department without spending money for those resources they might need. As a HR-manager and SAP HR certified consultant I add weekly an interesting freeware software dealing with HR-issues. 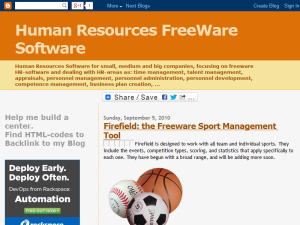 This what your Human Resources Freeware Software Blog Ad will look like to visitors! Of course you will want to use keywords and ad targeting to get the most out of your ad campaign! So purchase an ad space today before there all gone! If you are the owner of Human Resources Freeware Software, or someone who enjoys this blog why not upgrade it to a Featured Listing or Permanent Listing?